Tired of being huddled around a computer or smartphone to watch that cute cat video? Well huddle no longer! 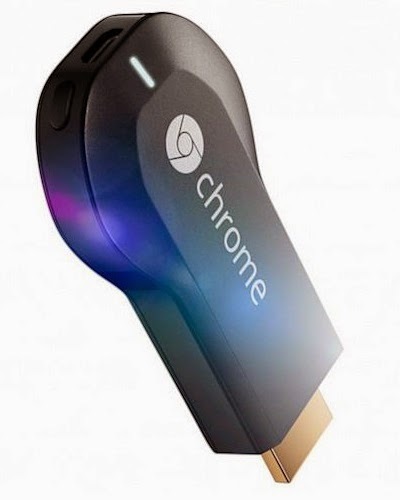 For only $35, Google Chromecast is a small device that plugs into an HDMI port on whichever desired t.v. to stream video and audio wirelessly. After installing the app and some simple setup for the device, you’ll be streaming in no time. Once you’re all set up you can begin streaming from various apps that support Chromecast (Netflix, Hulu, HBO Go, Youtube, Pandora, and more). However, if you’re streaming something from another site while using the Chrome browser, there’s an option to cast your current tab. Currently, there’s an experimental feature in which you can cast your entire screen. As long as a device is supported and connected to the wi-fi network associated with the Chromecast, you can stream from it. Not to mention, after steaming begins you can start multitasking on your computer or smartphone. That means you can check out pretty nifty blogs while watching your favorite videos! Just sayin’. Now that I’ve mentioned all the nifty features and uses, I’ll note on some things that you should know before getting this device. There is currently no security, anything connected to your wi-fi network can cast if it’s a supported device. Steaming will be affected by your internet connection and your device performance. In my experience, you cannot stream full screen games when casting the entire screen. There is no support for any browser other than Google Chrome. The device needs a power source, it comes with a USB cord. My television didn’t have a USB port in the back, but it also came with a wall adapter, so plan on having a plug free if you need it. Overall, I really like this device and use it frequently. I stream Netflix while multitasking constantly. In fact, I’m watching Sherlock as I write this post. The ease of taking it from room to room and hooking it up to any t.v. is nice. It’s not as useful as I had hoped for streaming a game onto the television, but that really doesn’t put a damper on this device considering that’s not what it was made for. I find Chromecast to be wonderful for streaming at an affordable price. Now, back to building my empire in Minecraft while catching up on t.v. shows!